I spent about eight hours cleaning my apartment, assembling all my to-purge items in a big “organized” pile, rearranging my living room, cutting a LOT of clutter stress, and making everything pretty enough to show the world on my blog. The couch is a Salvation Army store find, covered in a white blanket because I didn’t like the floral print it had. The rug is three kitchen rugs that I stitched together with embroidery thread. The coffee table is a footlocker/trunk that I spray-painted white. My desk area is comprised of an end table that my mom and I painted white this summer, and a storage ottoman I am using as a stool until I procure a desk chair I like. And there are a couple of my record paintings on the wall and a print of Van Gogh’s Starry Night, my favorite painting. It used to be hanging in the center of the front wall, but I can’t put nails in the wall so it was up with 3M velcro strips and it proved too heavy. Sad day. I’ll paint something for the wall eventually. This is the corner by my door, featuring a bookshelf – those are all the books I own, a far cry from my initial library — and easel. The pretty box on the floor holds some records for painting projects. The wall has various photos and another record painting. 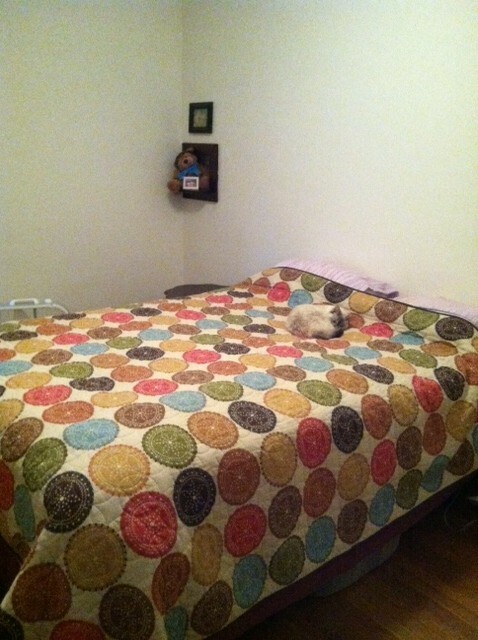 My bedroom, which is finally clean. 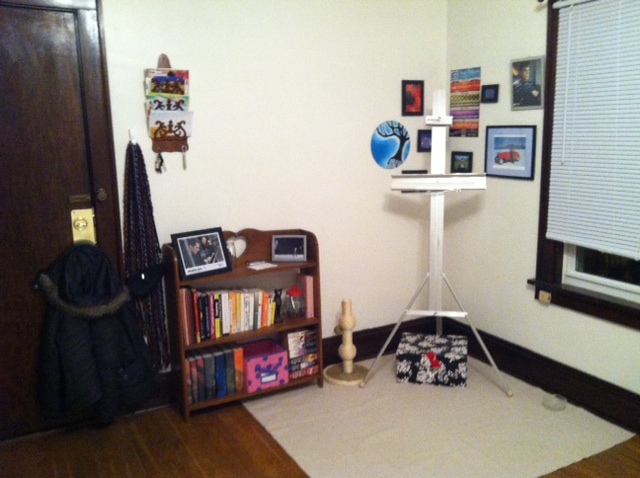 I have two end tables (you can sort of see one in the background) which are finally clear of ALL CLUTTER. My end table only has a book and my phone charger on it. 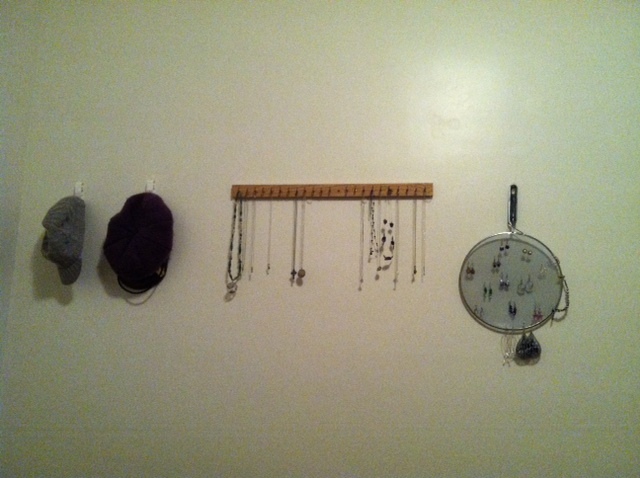 Hats, necklaces, and earrings are displayed on the wall. I haven’t worn a lot of the jewelry lately, so some of it will likely end up in The Great Purge of 2013. Next up is the kitchen! Stove – clean. Sink – clean. Counters – clean. Satellite bowl full of oranges – awesome. Breakfast nook – lovely, and clean! Sign stating, “It’s official – I’ve become my mother” – hilarious, and true. Magnetic knife rack under the cabinet. Wall-mounted hooks (love those 3M strips) for cutting board and colander. Shoe organizer on the fridge to hold utensils. One day soon I will get rid of those awful plastic utensils. Also, that’s Zoe! All sparkling clean! 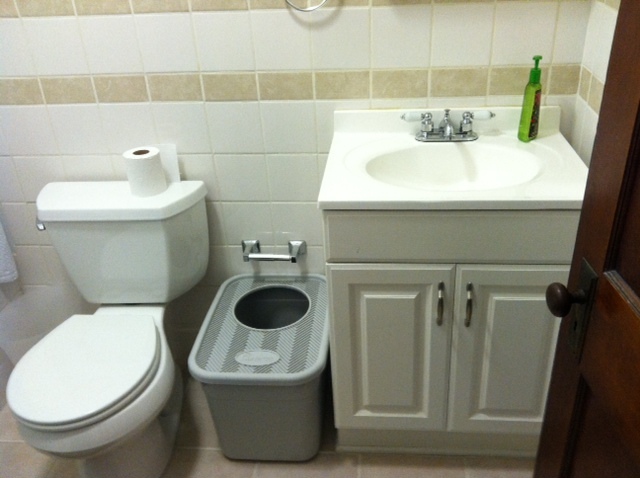 And ZERO clutter, since everything fits in the vanity or medicine cabinet. Very soon that soap will be all used up and replaced with a natural alternative! Also, note my cat’s fancy top-entry litter box, full of eco-friendly and cat-friendly paper litter. I hope you’ve enjoyed my tour! Cleaning marathons can be so therapeutic. 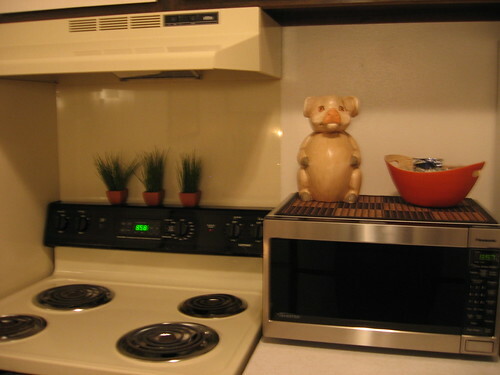 I love the kitchen especially — the lack of clutter makes it feel like it’d be a nice place to actually cook. Also: beautiful breakfast nook! Thanks! It was great to just power through all the mess. I was so unhappy with all the clutter, it was stressing me out without me even realizing. I feel so much better! 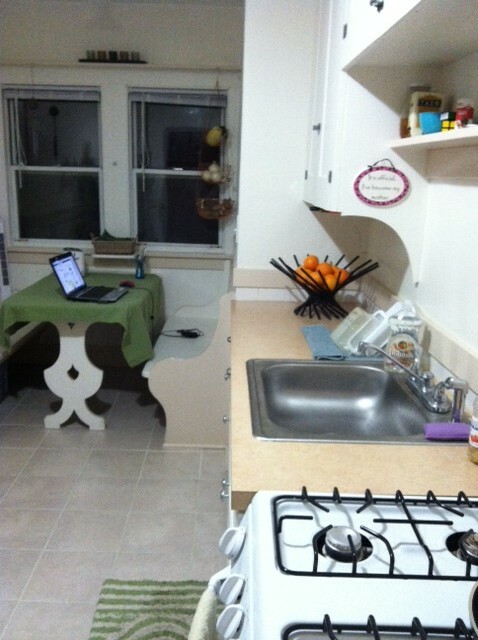 Hi Caitlin, thanks for sharing your house with us all – it looks great! Myself and my husband are currently in the process of de-cluttering (every day we find something new to donate or sell/freecycle) so it’s always interesting to see how others are doing with their own de-cluttering adventures. We are also swapping, as you are, all nasty chemical laden products with natural alternatives, even if that means they have to be homemade, so be it. Good luck with your ‘chemical purge’! Also, lovely to see a picture of your cat Zoe, we have two – Lyle and Lucy. Pets can create problems when you’re as minimalist as we are (we also have 2 rabbits, a dog and 6 fish…) but we’ve found some handy food and litter storage solutions, there’s always a way! Another successful minimalist upgrade was the swapping of our traditional desktop for an all in one wirless version, much neater with no bulky tower and just one wire! Loving all the posts and tips/stories as always so thanks for another great one! Dawn – Yorkshire, England. I’ve thought about what it means to be a minimalist with pets… I’ll write a post on it soon, I imagine. Thanks for sharing! Thank you! I love my little adorable apartment with my breakfast nook 🙂 it was a godsend when I found it on Craigslist of all places! And yes, it’s so great to have done another purge. Mmmm, clear surfaces. Your apartment is super cute! Love the breakfast nook and your storage tips! Love it! I love trees so much, so I’m all about your tree decor. Love it- especially the cat curled up on the bed 🙂 I like the white walls- ours are mostly neutral, although with some darker, patterned wallpaper (put in by previous owners, but I quite like it). If/when we re-paint, I’m definitely sticking to pale colours! Although I have decluttered a lot of stuff, your pictures have made me realise how much I like not being able to see stuff on surfaces…so there is definitely more that needs to go! Kitchen is pretty good, book/DVD/CD collection..Urgh! Sadly not all mine, so just have to purge what I can.. Loved the tour, your eating nook would be my favorite spot to sit and have that morning, afternoon, and evening tea. Okay so I would live in that nook if I could. I’d love to see some close-ups of your record paintings. I purged my plastic utensils a few years ago, but with not having a stove I’m now getting rid of some of my metal ones as well. Wish you lived closer I’d give them to you instead of the thrift shop. Yuck!! I just gave my stainless steel pans to my son and his wife as I didn’t know anyone else who would use them, everyone around here likes non-stick. I’d love to see some of your paintings. I added a tab to the blog with some paintings. I had vague plans of starting a custom painting business but I only ever sold three and the painting business didn’t really take off. I thought about etsy, but I never got the motivation to set it up. We’ll see how it goes in the future. I’ve been content to give them away as gifts mostly! That looks AWESOME!! What a clean, uncluttered, beautiful and creative space! Well done, well done! Thank you! Now the challenge is keeping it this way! What a great idea for the knives! I am going to do that pronto and get rid of my knife block in my cupboard (mostly because my 3 year old tries to cut his own apples, I have to keep it awkwardly up). I love the magnetic strip! It’s just up there with two velcro 3M strips. It’s never fallen down. Thank you for opening up your life to get a sneak peek of how you live. And thanks for being honest about the clean up beforehand. The pre-photo clean up seemed to help with your cluttering journey. I really needed a good deep clean. I’ve got a pile of stuff to donate/sell/give away now, which is great. Thanks for the comment! Thanks for sharing your home. It’s inspiring to see what minimalism looks like in practice. Good on you!